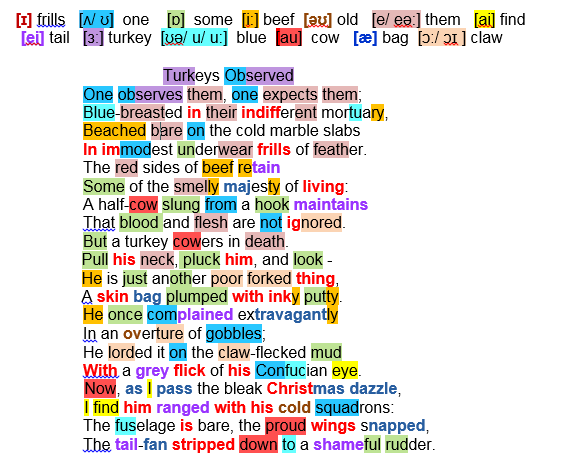 Providing a master class in transposing close observation into verse Heaney laments the sorry sight of turkeys slaughtered for Christmas. Shop-window displays of traditional festive British fare generate a chain of associations in the poet’s mind linking the ‘v’ of the Diviner’s hazel stick and the ‘v’ of a turkey’s wishbone (poor forked thing)! He paints a pitiful scene: plucked turkeys, blue-breasted in death, displayed unfeelingly in butchers’ shops (indifferent mortuary), beached like huge sea creatures on the shore, lying on cold marble slabs, stripped (bare) of their dignity save for butcher’s decoration (immodest underwear frills of feather). Hung beef has grandeur, retaining some of the smelly majesty of living; to Heaney the presence of a side of beef respectfully echoes spiritual Communion (blood and flesh are not ignored). No such dignity amongst poultry: the turkey cowers in death, all too easily despatched and de-feathered, quickly consumed right down to its ‘wishbone’ just another poor forked thing. Impressively Heaney’s compositional skills weave the corpse’s shape, size, consistency and colour into fewer than ten syllables: A skin bag plumped with inky putty. Alive, the turkey was querulous (complained extravagantly … lorded it), dominating the farm-yard’s claw-flecked mud, evoking the blinking presence of some ancient, wise philosopher (grey flick of his Confucian eye). In death turkeys form part of the bleak Christmas dazzle, ubiquitous and as distressing as abandoned aircraft ranged in their cold squadrons, bereft of their former glory (fuselage…bare…proud wings snapped), their sorry downfall manifest in the body section that once gave it direction: The tail-fan stripped down to a shameful rudder.